Late Bankim Chandra Chattopadhyay or Bankim Chandra Chatterjee (26 June 1838–8 April 1894) celebrates a special place in the hearts of all Indian people. Though he wrote many books and other stuffs, he was, is and will be remembered best for his magnum opus Anandmath. 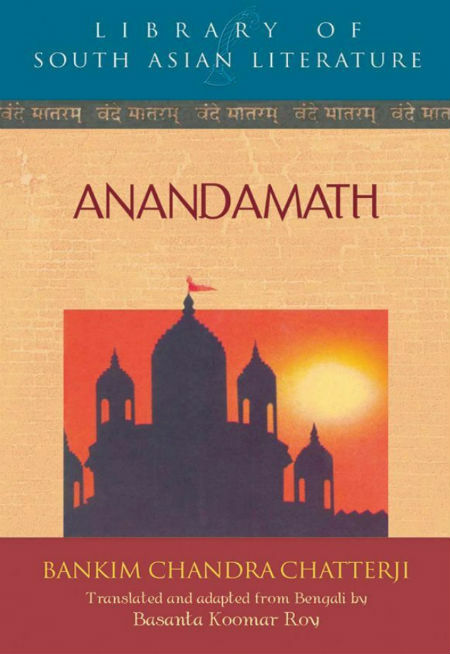 Anandmath is not only a book, but the container of the National song of India – Vande Mataram. Yes, the song – Vande Mataram – initially wrote as the part of the book (actually it is the soul of the book) got so much popular upon its release that it soon became the part of various rallies happened as part of freedom struggle of India from British rule. Eventually, the song became heart of the freedom fight and the phrase Vande Mataram is considered as one of the most respected slogans among patriot Indians. If late Chatterji haven’t created anything else, then also, this single creation could have made him immortal! We got a chance to purchase the book Anandmath (Kindle edition) at good price from Amazon, in order to complete our long-unfulfilled dream to read it. And we must say the book is worth every penny spent for it, and every second you invest to read it, is the best part of your time. मातरम्। Mother, I bow to thee! First large segment of the book is devoted to introduction of Late Bankim Chandra (the author of original book, what we have read is English translation of the same). Late Ravindranath Tagore, Maharshi Arvind and others respected highly, Bankim Chandra and his works. It is worth to note that even Ravindranath (or Rabindranath) Tagore respected him so high, that when he first knew that Bankim Chandra know him and even read some of his works, he was more than overwhelmed. The fact that his work is recognised by Bankim Chandra was not less important for Late Tagore then the Nobel prize he won! I think this fact is evident enough to know about the literary skills of Bankim Chandra (and his persona as a human being). India’s ancient classical language is Sanskrit, the mother of all Aryan tongues, including Greek, Latin and their European derivatives. After knowing so much, when we start reading book, we were taken into per-independence arena. It was the time when even the nature was acting against the people of India. The explanation of the living conditions of people in some areas of Bengal those days, will make you teary. It will pass a cold from the spine to know the way people need to follow in order to delay the almost certain death for a few days. The writer didn’t try to explore such stuff in melodramatic way, but the story moves ahead in simple, straight forward manner. And yet, it is very effective. No over the top talks, no superlative things and yet very effective exploration of harsh realities people face during those days. Only a remarkable author can do which Bankim chamdra was able to do. Kudos to him. The way the song Vande Mataram (in book – Bande Mataram – as per the pronunciation style of Bengali people) is weaved in the book, is simply superb. The song acts as one of the protagonists of the book. Life is so insignificant that it is the simplest thing for anyone to sacrifice. King’s you say! What right has an English King to the wealth of our land? We are not afraid. A man never dies more than once in one life. See, the line is not only brave and motivational or inspirational. It also reinforces the fact that the Indians believe in the theory of Karma and re-birth. A child may not tell lie – nor may we brag. Who can free himself from all the ties of love and affection? The man who claims to do that, never knew what those ties were. We do not pretend to be above all attachment. We simply observe the sanctity of our vows. The man whose heart is tied with the strings of human attachment is like a kite that is tied to the reel; it cannot fly high or far from the earth below. The true meaning of renunciation is explored through the character of Swami Satya and his efforts. It reminded me what is explored in Episode 10 of Hindi TV Serial, Upanishad Ganga. Every quarter of the book takes you to the different arena. And you will see a different perspective. The purpose of literature, is to help toward ultimate perfection in the culture of beauty, and to instill purity into the mind of man by creative thoughts. The novel was later adapted into a film, Anand Math in 1952, directed by Hemen Gupta, starring Bharat Bhushan, Pradeep Kumar and Geeta Bali. Music was by Hemant Kumar, who gave a version of the Vande Mataram, which became a cult success. You cannot avoid reading this book.